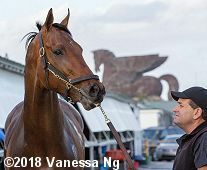 West Coast with assistant trainer Jimmy Barnes Friday morning at Gulfstream Park with the Pegasus statue in the background. 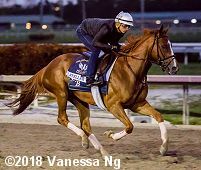 The second running of the $16 million Pegasus World Cup Invitational (G1) is Saturday at Gulfstream Park and all the horses entered are on the grounds now. Twelve will start plus there are two also-eligibles in case a horse scratches. 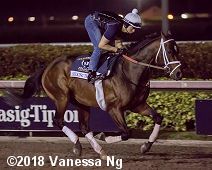 Here are some photos of them from Friday either on the track in the morning or schooling in the paddock in the afternoon. Conditions were excellent during training hours, with mostly cloudy skies, light wind, and temperatures in the low 70's. 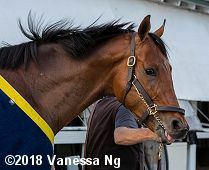 2018 Pegasus World Cup Thursday Photos - Lots of photos of the Pegasus World Cup horses either on the track, in the paddock, or in the barn at Gulfstream Park on Thursday. Collected galloped on Friday. Jockey Mike Smith said, "Why it's so hard to beat Gun Runner is that he's not a one-dimensional horse. He's not a horse that needs the lead. He's a horse that if they go quick enough, we've all seen him lag, second, third, fourth, and still run just as well as when he's had a comfortable lead. So he's going to tough to beat. I think you're going to even see a more of a big race feel to it this year. Man it's going to be incredible. I mean I've already got goosebumps just saying it." Giant Expectations went once around on Friday. Before shipping east, he worked 5f at Santa Anita last Friday in 58 seconds. Trainer Peter Eurton said, "He went well. I couldn't be happier. We'll know more as he goes along. We're taking it one day at a time." Regular rider Gary Stevens gets the call. 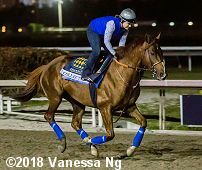 Gun Runner was out at 5:45am this morning. Jockey Florent Geroux said, "The horse is doing better than ever, just getting into a nice rhythm. But there's the other side of the game, too, in the breeding shed. It's a lot of money for him in the stallion lineup. It can be risky, the horse on the track. I understand both sides of it but (his retirement) is definitely sad for me. 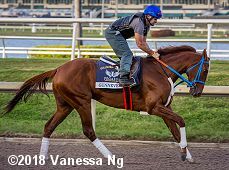 We liked him from the beginning, though he wasn't the Gun Runner he is obviously is right now. But, he's always been a very talented horse. We knew after he won the Louisiana Derby so easily that we had something serious. 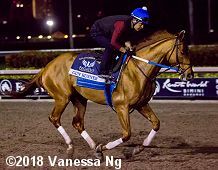 Riding a horse like Gun Runner shows people you can do it, you can ride a horse that nice and that caliber. Hopefully, Gun Runner will bring more horses like him to me in my career." 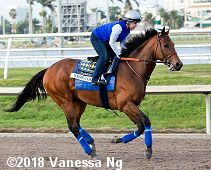 Gunnevera galloped on Friday. 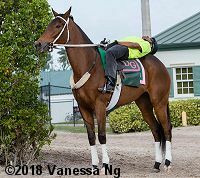 Locally based trainer Antonio Sano said, "This (Gulfstream Park) is my house. My horse is training very, very well. For me the horse is 100 percent." 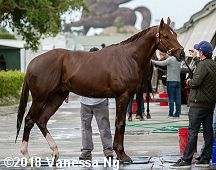 Co-owner Bill Gallo added, "I was thinking if the horse came in second, third of fourth I'd be thrilled, But after seeing the horse, I think we got a chance." Seeking the Soul galloped on Friday. Trainer Dallas Stewart said, "He's just been very sharp, very happy about his job. He's eating well, he's healthy, and he looks great, he's all dappled out. I think he's going to be ready to go. Mr. Stronach's put the money up. He wants the good horses there. 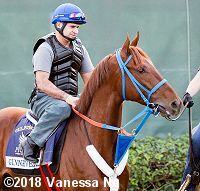 It's an honor to have a horse like this to bring there." 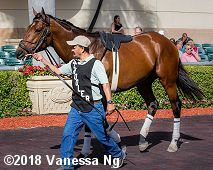 Singing Bullet schooled in the paddock Friday. 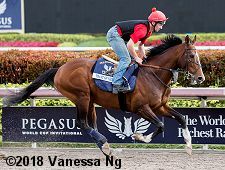 Trainer Dale Romans said of his 5f workout in 1:01.97 last Saturday, "He worked very well. He went off the first eighth a little slower than I wanted but he finished up great and galloped out great. He's been doing very well since he got here. The last race was a throw out. He came stumbling out of the gate and just had no chance to catch up." Stellar Wind is the lone distaffer in the race and will make her final career start in the Pegasus. Owner Peggy Augustus of Keswick Stables said, "I have no problem with mares running against colts. She likes to win, so maybe she'll beat them. Her biggest problem is getting out of the gate. But she looks like she's been working well, running well. She has a new jockey, new trainer, and maybe a new lease on winning." Toast of New York went out for a gallop. Jockey Frankie Dettori said, "It's going to be the richest race ever run on the planet. I think the big credit must go to Mr. (Frank) Stronach for coming up with his idea. Of course, I'm excited. If you can't get excited about it, there's no point in getting out of bed. We know that he handles the dirt. He was second in the Classic. That form is good enough. We'll roll the dice and go for it. The thing that we don't know: Is he still the same horse he was three years ago?" West Coast was sent out for a gallop by trainer Bob Baffert. Owner Gary West said, "I'm pretty biased as all owners are about their horses. I personally believe he has the best resume of the 3-year-olds. But, of course, that is up to the voters. Sometimes they disagree with owners. Had we pushed this horse early to get him into the Kentucky Derby or the Triple Crown races, I don't think he'd be up for an Eclipse Award. I think it probably would have been a terrible, terrible disservice to the horse. It took him the amount of time we gave him to come into his own and to mature and develop." 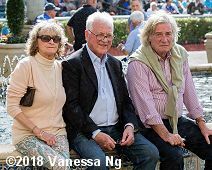 Left: Frank Stronach and friends in the paddock at Gulfstream Park on Friday afternoon. Belinda Stronach said, "This year, the purse is $16 million. The winner takes home $7 million, but I think it is great Dubai raised their purse money because I believe a rising tide lifts all ships. It is good for our sport. We have the top five Breeders' Cup winners. We have the first filly ever -- Stellar Wind. 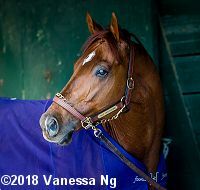 We have a horse out of Europe -- the first horse out of Europe -- (and) Toast of New York that came out of retirement that was in stud for two years." 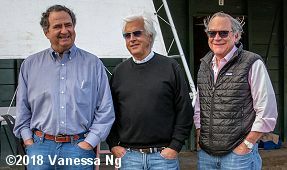 Right: Trainer Bob Baffert (center) and West Coast's owner Gary West (right) at the barn on Friday morning. 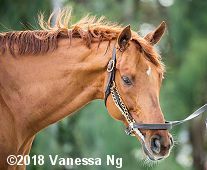 West added, "He is the most accomplished horse we've had. We've had what I thought were some really, really good horses whose careers were cut short by an injury of some kind and had to be retired prematurely. I was very pleased with his performance in the Classic. The only two horses that beat him were the number one and number two rated dirt horses (currently in training) in the entire world." After early mornings at the track, you have to catch a nap whenever you can.